Incoterms 2010 are adhered to by all major trading nations of the world, and it is the authoritative text for determining how costs and risks are allocated to the parties conducting international transactions. Incoterms facilitate the conduct of international business by defining the responsibilities of the involved participants. This is the sixth article in our series investigating the basic meaning of all 11 Incoterms. Today, we’re discussing the Incoterm CIP, also known as Carriage and Insurance Paid To. 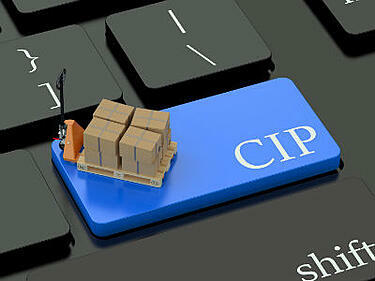 What Does the CIP Trade Term Mean? When Can CIP Be Used? CIP can be used for any transport mode—air, courier, truck, rail, vessel or multi-modal. With the CIP term, the seller also contracts for minimum insurance coverage against the buyer’s risk of loss of or damage to the goods during the carriage. If the buyer wants more insurance, they should make an explicit agreement for additional insurance coverage in the sales contract or make their own arrangements for extra insurance.